However, the pulse of house and electric dance music is heart and life blood of Future: Love, Life, Vibration. That is not surprising. Alston cites DJ as one of his many callings, and that means that keeping people on the dance floor is one of his missions. He also fronts a band, Malik Alston & the Linwood Ensemble, and has performed with who’s who of music innovators ranging from Les Nubians to Robert Glasper. Alston brings all of those influences to the ultimate goal of creating club music, and Future: Love, Life, Vibration is an adventurous work that contains the virtues and vices long associated with house and EDM music. Those virtues are the pulsating beats and complex arrangements that draw from disco, Latin, hip-hop and other dance-oriented genres that attract people to the dance floor. The weakness, at least this will be a weakness for those who are not deep into house or EDM, is that oft cited criticism that cuts in these genres can be repetitive. 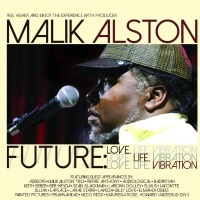 Still, Alston adds elements such as jazz improvisation, strong vocal performances and lyrical content that provide Future: Love, Love, Life, Vibration with some welcome variety. The track “Sumba” delivers a story of passion that features the sensual vocals of Neco, the simmering spoken word of Ber-Henda delivered over a pulsating Latin tinged arrangement that highlights Alston’s spacey, 1970s styled keyboard work. “What God Has For Me” is perhaps the strongest effort on the Saturn portion of Future: Love, Life, Vibration. Alston fuses the power packed church vocals of Maurissa Rose with the kind of banging funk that has not been heard in a gospel track since Ann Nesby and The Sounds of Blackness were tearing down the boundaries between gospel and hard hitting funk. “What God Has For Me,” the last cut on “Saturn,” serves as a perfect segue into “Pluto,” part 2 of Future: Love, Life, Vibration. “Pluto” begins with “The Funky Ones,” a deep, grinding funk number distinguished by its muted trumpet and the gospel choral backing vocals that might remind some of P-Funk background singers on classics such as “Flashlight.” Alston cites Gil-Scott Heron and the Last Poets as influences, and that can be heard in the “Afro Life,” a piece that features spoken word and rap and that speaks truth to power while seeking to awaken the masses. Malik Alston seeks to create a work that moves beyond the limits of house and EDM. Yes, the record still wants to fill the dance floors and those pulsating, infectious and yes often repetitive beats will serve that purpose. However, there is message to much of this, so there will be no getting lost in the music. Alston manages to make his crowd dance and think. Recommended.